As we have anticipated about possible wateen’s relaunch, we have got this news confirmed after seeing today’s advertisement, very ambiguous one tough – no details at all. If you point to their website, you will be amazed that there are no tariff details available there too. I am wondering why Wateen thinks their call center can perform better than their website in snatching customers. Just couple of more lines before we go to tariff – advertisement published in newspapers is the most confusing part of Wateen. Following is the advertisment, and then review below given rates – you can decide yourself. One more thing that you must have to avail telephony services in order to get WiMAX broadband – meaning that you will have to pay the monthly rental for telephony, even if you need internet only. So in case you don’t need telephony, you should subscribe to lowest package that is available at Rs. 120 plus tax per month. By the way, if you want to replace your PTCL with Wateen’s telephony services, then check following tariff. How much Total Money you will have to pay? *Replace Package price as above if you want any other package (Details given in above table). You may have to spend Rs. 599 if you require installation services from Wateen. Subscription charges: Rs 2,499/- one time only. Thanks for the details, You have realy worked hard for compiling all that. Can i have the same details for witribe. Means ist time charges. monthly charges. download limits etc. I have heared that they have also changed their package plans which are not on the site. and I have also heared that Wi tribe will give you free unlimited download from 10 PM to 9 AM daily at double of your subscribed speed. Okay we will bring you those Wi-Tribe details as well, if they got updated. Great unlimited packages from wateen. 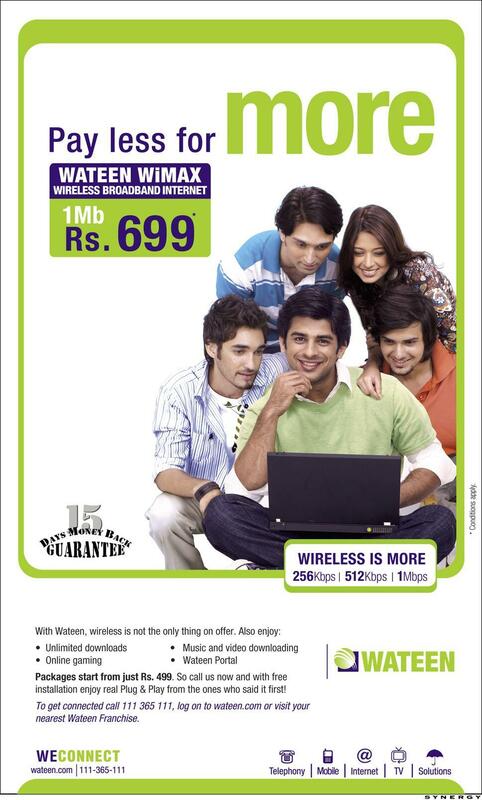 Wateen is the only wimax operator offering unlimited downloads. witribe has no such offering plus wateen’s service works in more than 20 cities. witribe is available in limited areas in 4 cities only. Yr wateen is far beter thn ptcl nd othr wimax providers i used wateen fr 6 mths bt left it cuz its 5gb limit! Nw i m using ptcl bt jo wateen ma maza tha wo ismay ni ha uski speed bht anth ha! Pakistn ma masla ye hai k hum log wimax ko broadbnd k sth compare krte hain nd wimax lacs behind cuz of its initial costs nd mnthly charges ku k ptcl wich is da largest company ov pakistan has its brodbnd! I Believe PTCL is much better then Wateen… If your Telephone works Fine then there is no way that PTCL Service go Down…. After seeing Wateen ad i called their customer service number. I m surprised they way i have been treated and all required details was given. I dont think its ambigous. It is very clear and exactlay what they were offering. Good to see Wateen back in action ….good for users. Well i agree with Shaidbukhair, you have done a great job to compile all information. I was wondering where do you get all this info from. Anyways 15 days money back guarantee is really required nowadays. 7 days was not at all enough. being a student iam really happy that wateen has affordable packages and i dont have to wait for my next months pocket money to fill in my account. I have been using Wateen for a while now and I have got the new Package “Unlimited” and the download speed is awesome. I get over 140/kbps. This is the best service I would recommend to all my fellas. As long as that so called “fair usage policy” clause is there, you cannot call it unlimited. Mr. PTA, please do something about these misleading advertising tactics by the telecom companies! Well done tariff composition. very clear & loud for any user. Wateen seems to hit back strongly this time as they have bundle of product line along with very much improved customer care & service. I personally think, this relaunch will moved the broadband industry up & high. I heard, wateen is launching USB internet as well. If yes then Wi-tribe must be ready for tough competition ahead as wateen is much bigger platform for any kind of internet based products. The revision in prices is quite welcome :) .. but the Unlimited 1MB connection.. it says “Fair usage policy” applies. That means a cap on the limit.. (which i dont know exactly).. but even if its 2- or 50bg.. it is a letoff for regular internet donwnloaders.. This is one area thye can improve on imho..
Hey Amir Atta, Nice work dude. Please Let us know about the quality of service of wateen ? I don’t wana waste my time & money on a poor service. @Aamir Attaa What about the quality .. Who is best in terms of Quality? In terms of broadband/WiMAX services, it greatly depends on your area. If you are in a town where there are 100 Wateen customers, while 7 WiTribe customers, them defiantly WiTribe will perform better. However, situation won’t remain the same for ever. Fair Usage Policy –>> 100 GB limit…. i think u cannot use beyond that….100 GB is more than enough…. I have confirmed it from wateen’s franchise and technical support (worst ever I have experienced). wateen is giving a very bad services in karachi. It is not 100GB, who told you this Farhan bhai. it is confirmed 30 Gb for 30 days with 1MB and when you reached your 30GB you will get speed speed 256 and 512. @Farhan.. i dont think its a 100GB limit.. but if it is.. then even i think its pretty dan ok :) However, NO wateen official confirms this.. why?! however wateens portal is one advantage … and what is that? Yes boys you are right upto some extent as standard fair usage policy means rufly around 30-40GB but as of today with my experience it is open / 100GB. Mera cousin wateen use karta hai 1 mb-10 gb 1300/month lekin os ka net aksar kharab rehta hai. I found this website a home portal for telephony and internet info so I wish I may get alerts for information regarding the above in KARAChi. accrdng 2 PTA da bst frequency n sgnl it hz. 9 nothr broadbnd cmparision 2 QUBEE. pLZ, tell me whts the unlimited(fair usage policy of wateen) thannx……………i mean how much v can use in unlimited package…….. It seems Wateen is trying outdo Qubee. What really matters is the quality of service. What is the range of Wateen’s CPE? Can a laptop be used moving around the house, or will walls and floors interfere? unlimited ka mtlab hai. k tum jatna downloading kr skty ho karo koe ben nahi koe charges nahi it,s enough. wateen new data usage policy is unfair and very strange policy ! a common thing is wateen package name is 1mb unlimited but get only 40gb with 1mb today ! after this data stage get speed only 250kbps. 1st i said that wateen telling a lie to every customer . please every one complaint and request to mr ceo or owner of wateen telecom. wateen old usage policy is good and truth because maximum speed with maximum data usage is like that unlimited. Thankue in advance for give me a big favour!